Local literary publisher, Four Chambers Press is now accepting full-length manuscript submissions in poetry, fiction, and creative nonfiction through July 31st, 2017. Poetry should be between 60 and 160 pgs; prose should be between 30k and 80k words. For full guidelines, visit our website at http://fourchamberspress.com/submit. From their press release: Four Chambers Press, an independent community press based in Phoenix, AZ is now accepting full-length manuscript submissions in poetry, fiction, creative nonfiction, hybrid, and all other forms of contemporary literature through Monday, July 31st, 2017. We also pun frequently on the idea of being a heart. Namely: that we’re lovable; somewhat cheeky; an occasional flirt. But we also take the responsibility of literature and book publishing very seriously. We will bleed for this if we have to. Our hearts beat for this. We don’t care where you come from or what you do. We’re interested in building something that’s going to outlast us. We want to feel something together. We’re interested in you. Writers of all backgrounds and skill levels are encouraged to submit. No fees. Is Pushcart Pushing Out Online Publications? With every new year comes a new edition of the Pushcart Prize and with it, the names of publications and pieces lucky enough to grace its pages. Known for compiling submissions from small presses all over the world, Pushcart has created a high standard of quality that authors and literary magazines alike hope to achieve. Perpetual Folly has released a ranking of Fiction, Non-Fiction, and Poetry submissions published in the Pushcart by each literary publication for 2012. While some notable names like Tin House, Poetry, and Ploughshares grace the top spots, some new faces have also joined the ranks. The rankings are a great way to discover new publications and revisit some familiar magazines. You can also see rankings from 2010, 2009, and 2008. 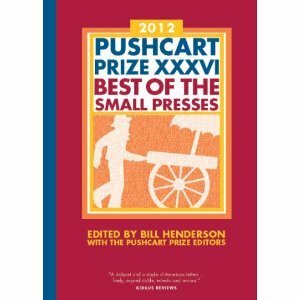 The Pushcart Prize, known for its prestigious spot on the small press altar, has come under recent criticism for its narrowed scope. Pushcart editor Bill Henderson wrote in his introduction: “I have long railed against the e-book and instant Internet publication as damaging to writers. Instant anything is dangerous – great writing takes time. You should long to be as good as John Milton and Reynolds Price, not just barf into the electronic void.” There’s an excellent article about this comment in Luna Park, but we’d like to add our thoughts as well..
Publishing has come a long way since the days of stone tablets. Digital media has become a rapidly evolving field that is changing the way we consume literature. While some literary magazines have already converted to online platforms, other notable publications stand by their steadfast printers and traditional paper mediums. The Pushcart’s bias against online publishing is apparent: only one submission from an online publication was printed in the 2012 Pushcart anthology. Pushcart had long been known for incorporating the best of the best small presses, but if it continues to disregard online publications, it will no longer be representative of small press publishing. While not all online magazines uphold the same rigorous editing procedures of their print counterparts, many maintain traditional practices of print journals, with the only change being that they are free and immediately accessible. We can understand Henderson’s argument to some degree. Online publishing, after all, is a double-edged sword. Often, editing is sacrificed in the name of immediate publication. An author can write a sentence and hit submit without a second thought. It can lack the craft and artistic value that many unplugged authors have spent years honing. However, online publication also opens doors to high-quality work. Connecting in a digital environment increases accessibility, eliminates physical printing constraints, and fosters collaboration and community. We have to ask ourselves, how long will Pushcart continue to ignore the growing field of online lit mags?